An extra-special Valentine's edition with more sap than necessary for any MADE UP HOLIDAY. This book is romance. It oozes it right out of the binding and gets all over your pajama bottoms. 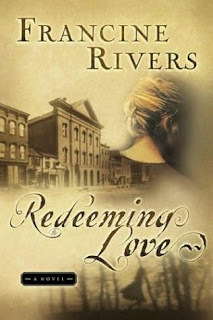 Redeeming Love by Francine Rivers is a retelling of the biblical story of Hosea which in and of itself is a heartbreaker. However, it's also a reminder that the love of God is unconditional and He is faithful even when we are not. He really is. This is one of those movies I can watch ad nauseum and still start crying. Return to Me is a quaint movie about how destiny can be a beautiful thing even if it includes tragedy. You also can't beat a movie that makes heart transplants hilarious. Oh, Eastmountainsouth, where have you gone? This debut album perfectly blends country and folk in a way that doesn't prompt you to make out with a first cousin. This song, So Are You To Me, always make me want to get married. This is why I don't listen to it prior to grocery shopping. I'm surely bound to leave with the ingredients for salsa and a bad relationship. Oh, this is only my favorite movie EVER! It never gets old. And if you have never done so, I highly recommend watching it again with the commentary on. It is as entertaining as the movie itself! M: You are dead on with the commentary. I heart Bonnie Hunt!